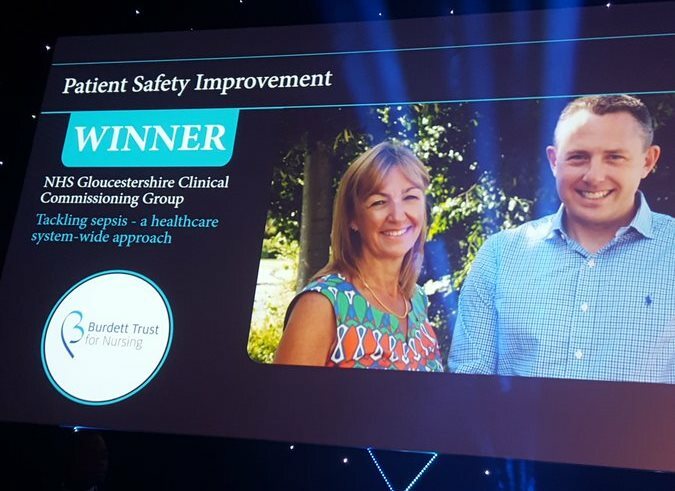 Gloucestershire CCG has won a Nursing Times Award for Patient Safety Improvement for its work to raise awareness of sepsis and support frontline clinical decision. Our understanding of patients with sepsis has changed: we are now aware how common it is and that it can arise from common infections such as pneumonia, UTI, cellulitis and abdominal conditions amongst other sources. Crucially we also know that early identification, prioritisation and treatment really can improve patient outcomes, although we also know how difficult it can be to recognise and prioritise patients, particularly in the community, where we can only rely on clinical acumen. In Gloucestershire, a number of tools are being used to support front line clinical decision making. Key to this is the National Early Warning Score (NEWS) which is being adopted across the West of England as an adjunct to clinical decision making, helping to prioritise the urgency assigned to a patient’s care. Find out more about our work to support the roll-out of NEWS.